Called e-Palette, the autonomous electric vehicle has no windshield and no fixed seats — but lots of potential applications. It’s a truck, it’s a taxi, it’s a mobile hotel. At the Consumer Electronics Show (CES) in Las Vegas, Toyota today announced that it is developing a driverless electric vehicle in partnership with Amazon, Uber, and Pizza Hut. 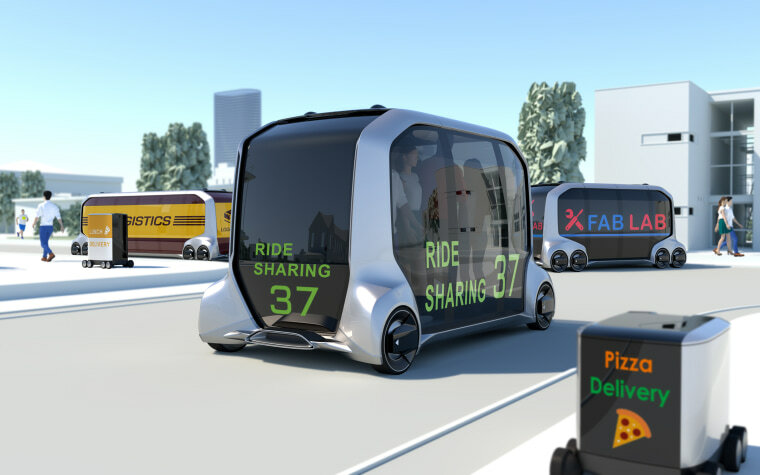 Called e-Palette, the concept vehicle has no windshield and no fixed seats but is designed for use as a passenger-carrying minivan, a parcel-delivery truck, or even a mobile office or hotel room. Larger than the self-driving taxis being tested by Alphabet spin-off Waymo but smaller than the driverless semi-trucks that Uber is working on, e-Palette is seen as a multipurpose urban runabout. The e-Palette shown at CES is a boxy vehicle about as big as a minivan, with Toyota planning a stretched version that will be about 23 feet in length. Toyota did not confirm a top speed for the e-Palette, although it is not designed for high-speed highway use. Amazon is developing an aerial drone package-delivery program called Prime Air, but this is the first partnership the company has revealed for driverless vehicles. At CES, Toyota shared a video showing two possible scenarios for Amazon’s use of e-Palette. In one, an e-Palette delivery truck drops off a package with help from a small robot that zips out to drop it at the customer’s front door. In the other, a customer orders shoes online, and an e-Palette mobile store shows up at his home. After trying on a few pairs inside the vehicle, the customer pays for one and the shop drives off. Toyota plans to debut the e-Palette at the 2020 summer Olympic Games in Tokyo, before moving on to conduct tests with partners in the U.S. But logistical and legal hurdles will have to be overcome before e-Palettes make inroads in the U.S.
By moving previously static businesses like shops and hotels on to public streets, Toyota and its partners may meet resistance from cities already struggling with congestion. Currently, a patchwork of local, state, and federal regulations determines whether and how autonomous vehicles and robots are allowed on streets and sidewalks. Navigating these regulations could prove as tricky as anything e-Palette meets on the road.